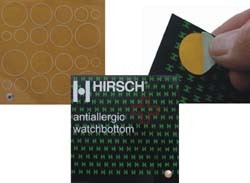 I found that Hirsch made leather pads with adhesive backing for watch wearers who are allergic to nickel. Although I am not allergic to nickel, I found that the pads can take up approximately a 1/4 link which is between the difference of using a microadjustment in the clasp and certainly more fine that adding/removing a bracelet link. Click images for larger pictures. The pads are made by Hirsch, known of their quality watch straps. The "watchbottoms" are available in either precut, or as a single sheet with a cutting template on the back. I ordered the single sheet from Tiktox in England. The watch bottoms come in one sheet with plastic circles to cut with either a knife or scissors. I found the plastic outlines did not to work well as cutting along the line was difficult as the plastic slipped and the cutting tool has to be very sharp. This is a somewhat more difficult than cutting paper. The tools I used to cut the watchbottoms are a simple circle template, an X-acto knife, and a swiss army knife for simple trimming. To discern which hole size to use, lay the template flat on the watch back. I found that the template had one hole template too big, and the next size was too small. I used the slightly larger size. With the watchbottoms up, lay the template flat, and cut in 1/4 circle increments. Be sure not to cut the template itself. Notice by the other holes that it took a few attempts to get the correct size and a round circle. Once the initial cut is made, use the slightly smaller hole in the template to trim the watchbottom pad down to the correct size. Once completed, apply the watchbottom on the caseback of the watch. After wearing the caseback pad for about a week, I found that the watch rode slightly higher, and did not slip across my wrist as easily as it did before. Once the casepad becomes soiled, it is not too hard to replace. The caseback pad is also prevents caseback scratches by the bracelet when the watch is removed. This is a simple adjustment to aid in the wearing of your watch. Be sure to check out the Bracelet Fitting page on other methods for fitting your Rolex.